The love of comfort and luxury, the hunt for treasures of all descriptions, and the thirst for gold is arguably one of humanity’s oldest and most driving forces. The great treasure hunt that began when life first started continued when we crawled from the mud to reach for the stars. From hunting for Easter eggs to scientific exploration, illegal antiquities trading, or going on a quest for life-boosting gold coins in a video game, it looks like the treasure hunt is set to continue. Archaeology, chance finds, museums, and countless other platforms have ample evidence of our ancient love of gold, wealth, and luxury. Perhaps one of the most famous examples is the tomb of ancient Egyptian pharaoh Tutankhamen. Discovered by Egyptologist Howard Carter in the 20th century, it had miraculously evaded being emptied by grave robbers in thousands of years since the young king’s death. King Tut’s famous gold mask, as well as many of the other priceless objects found in the tomb, continues to draw millions of tourists of Egypt. This year saw the opening of Golden Kingdoms: Luxury and Legacy in the Ancient Americas at the Getty Centre in Los Angeles, USA. Centre director Timothy Potts told CNN that the exhibition, dedicated to the materials treasured by pre-Columbian Aztecs and Mayans, includes objects made from gold, semi-precious stones such as jade, textiles, shell, and feathers. Developed by Joanne Pilsbury, the exhibition aims to highlight those cultures’ treasures to contrast the strong focus on gold work that dates back to the Spanish conquest. The quest for luxury, the love of gold, and the hunt for treasure played a role in the forging of the precious objects shown in museums around the world. That same driving force is the reason so many ancient treasures are there for us to see in those museums. It is also the same force that gets people off the sofa and into the sunshine, or keeps them firmly in place while they play video games or mobile casino games to win prizes. Hunting for treasure is part of what we do the world over. From millionaires having a bit of fun, and from augmented reality mobile games and geocaching to video-streamed live dealer casino games, there is no shortage of opportunities to hunt for some treasure of your own. Millionaire American art dealer Forrest Fenn self-published his memoirs recently. His book, the Thrill of the Chase, is a lively account of an interesting life that includes being shot down in Laos and Vietnam when fighting during the Vietnam War, and beating cancer. Despite his tales of bravery and derring-do, it is the poem on page 132 that has seen book sales soar. The poem found on that page is said to contain a number of clues to a cache of gold, diamonds, rubies, emeralds, sapphires, ancient jade carvings from China, and pre-Columbian fetishes and gold bracelets, said to be worth approximately US$2 million. 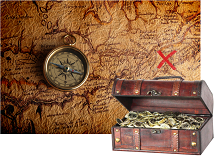 Fenn claims to have buried the treasure to get families off their couches, and get them to spend quality time with one another while enjoying a good, old-fashioned, real-life treasure hunt. Despite museums and millionaire art dealers, real gold is not something many of us encounter on a daily basis, unless it is the gold used in the circuitry of computers and other devices. However, for gamers, gold coins, diamonds, and other symbols of wealth continue to be part of the quest, whether for their life-boosting, weapon-buying abilities or because those symbols landing in the right combination on a slot payline really could pay out.